We have grown lettuces, chard, spinach, New Zealand spinach, kale, collards, arugula, pea shoots, basil, and oregano, all indoors and in yoghurt containers. Nadamayi's pick for the two most prolific lettuce varieties are baby oak leaf and Amish deer tongue. The Genovese basil has been the most successful of the basils. Supplies you will need are containers, soil, seeds, and fertilizer. 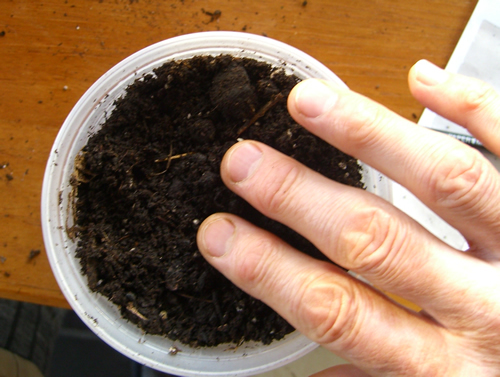 We use potting soil from a local garden supply center and sometimes supplement that with our own compost, but the compost is not a necessity. As we showed before with turf sprouting, we used a mix of liquid seaweed and liquid worm castings. We mix one tablespoon of each per gallon of water. 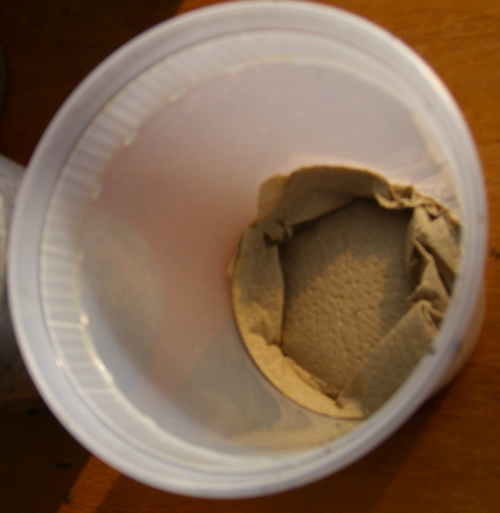 This is used to dampen the potting soil, and it is used once a week to feed the plants. When Phil was at the ashram, some mornings he would do tulsi seva — helping to water, feed, and pinch off parts of the tulsi plants for garlands. They would feed the tulsi plants once a week with manure tea, using the manure from the ashram cows. 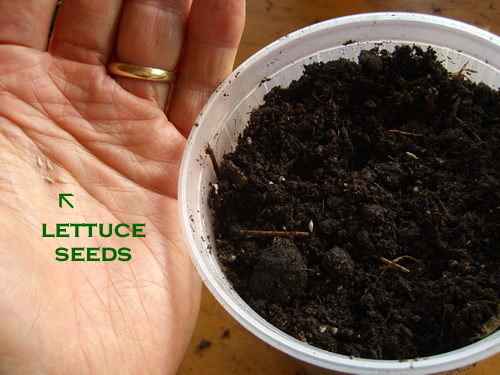 Your choice of vegetable seeds is very important. You can go to this link for more details. Cut slits on bottom for drainage. Place some paper towel on the bottom. 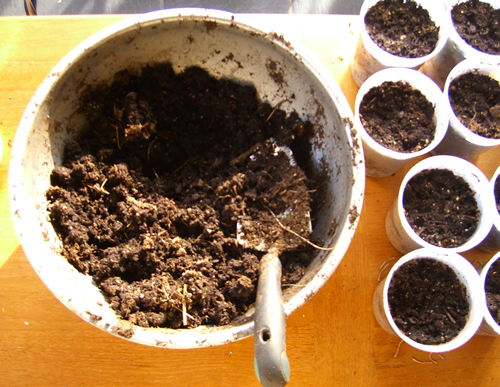 Damp mix of potting soil, fertilizer, and compost. 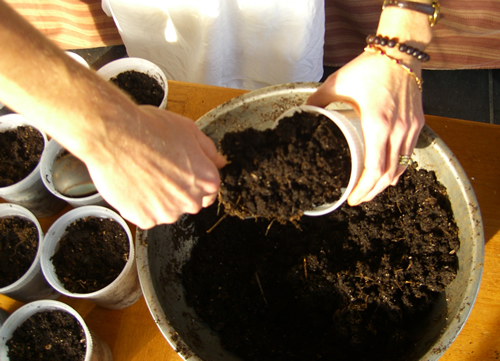 Scoop soil mix into container. Lightly tamp down soil mix. We pick the seed with fingertips. 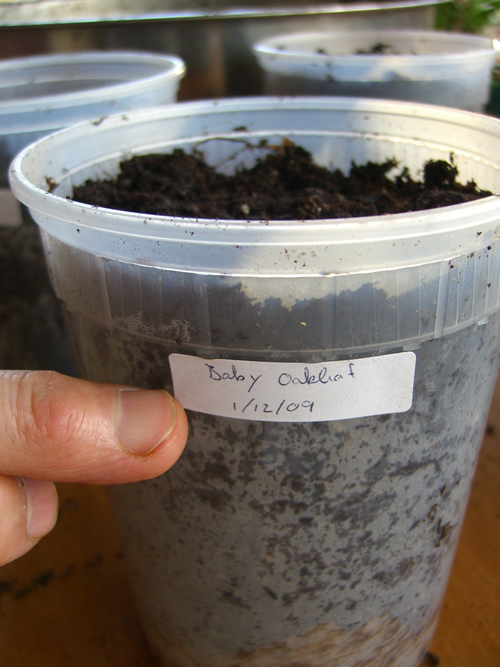 Try using 3-4 seeds per pot to assure germination. 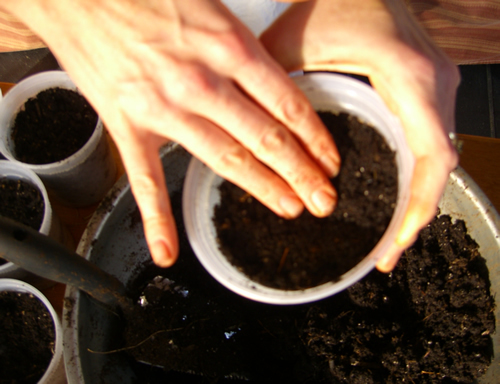 Right side: dropping seed into potting mix.
. . . or not, as you choose. 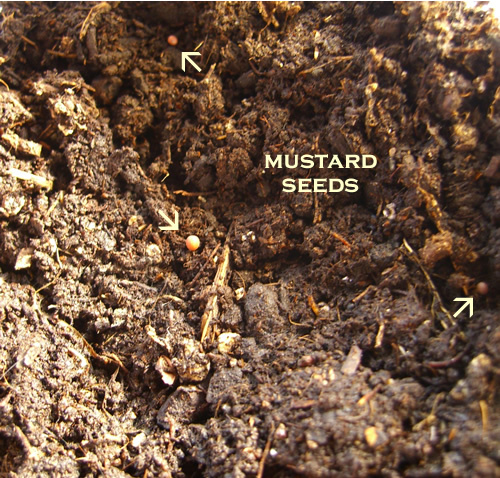 Cover seed with thin layer of soil, tamp down lightly. 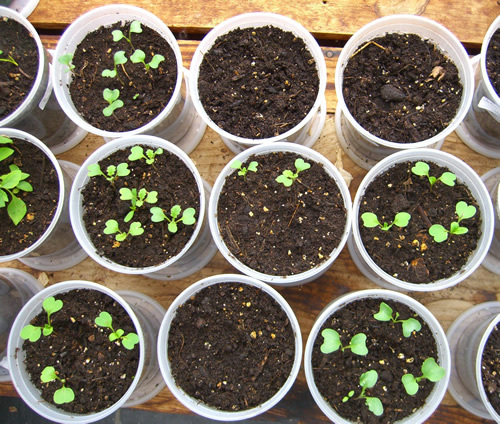 The seeds that were planted two weeks ago are pictured below. The arugula, broccoli, and mustard are up nicely, the lettuce is not visible yet. A number of factors influence how quickly a plant will develop. Foremost in temperature. It has been cold recently, so that has slowed things down a lot. 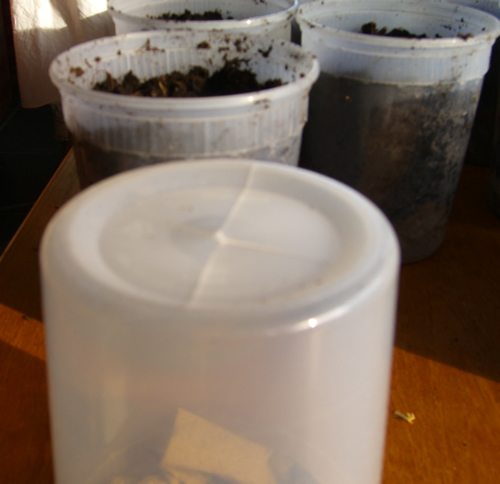 Another factor is how much soil the seed is covered with. Too much, and the baby plant has to take longer to push through, and can even be smothered. Too little, and the seed can dry out too much and never sprout.